A Heavy Duty mechanical type with a unique circuit to prevent contact arching when starting the pump. 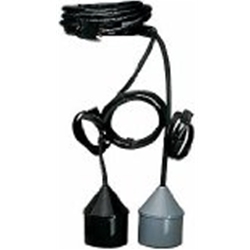 The float switch consists of two cables molded to one piggyback plug cord and two releasable mounting straps. Adjustable pumping range from 2" to 48".